﻿ Elephant House Addo. JIMAT di Agoda.com! Ada soalan mengenai Elephant House? Bagi para pelawat yang ingin menikmati sepenuhnya pengalaman di Addo, Elephant House merupakan pilihan tepat. Hanya 6.6 Km dari pusat bandar, lokasi strategik hotel memastikan tetamu boleh ke mana-mana sahaja dengan cepat dan mudah ke tempat-tempat tarikan. Persekitaran yang terjaga dan kedudukan berhampiran dengan Pusat Reptilia & Haiwan Liar Lembah Addo, Taman Organik Rosedale, Addo Wildlife Sanctuary memberi hotel ini daya tarikan istimewa. Ambil kesempatan daripada pelbagai perkhidmatan dan kemudahan yang tiada tandingan di hotel Addo ini. Wi-Fi percuma semua bilik, Wi-Fi di tempat awam, tempat letak kereta, khidmat bilik, pengangkutan lapangan terbang merupakan beberapa kemudahan yang membezakan Elephant House daripada hotel-hotel lain di bandar. Semua bilik tetamu menawarkan pelbagai jenis tahap keselesaan. Banyak bilik turut menyediakan bilik larangan merokok, penyaman udara, pemanas, panggilan kejut, meja untuk memuaskan hati tetamu. Di samping itu, pihak hotel menawarkan aktiviti rekreasi untuk memastikan anda mempunyai perkara untuk dilakukan sepanjang penginapan anda. Elephant House adalah destinasi sehenti anda bagi penginapan hotel berkualiti di Addo. This establishment ticked all the boxes for me ,situated a few kms away from main gate Addo Park .The grounds the rooms the ambience is really amazing, an experience to be enjoyed ,.before or after the game viewing drives.With the deterioration of the Park services from check in to departure, it is really worth staying outside and commuting into the park.The appointment of the rooms is excellent,and the swimming pools gardens ,lounges really outstanding.The breakfast served on the terrace area is lovely ,breakfasts original and very good.I cannot rate this property highly enough, and as a world traveller i have seen many . While we were trying to sleep we saw a bat flying through the bedroom. In the morning we immediately checked out and got reimbursed for the remaining nights. Thank you Charlene and the whole Elephant House Crew! We spent 6 nights there and would be still there if we had the time. It was awesome. From A like Awesome Area with the garden and the love rooms, D like Delicious Dinner & Breakfast, F like Fresh Flowers every day in our awesome & beautiful room and everywhere else in the hotel, L like Lovely Laughter (like Charlene), P like Plenty cool Poolsessions, S like Super-excellent Service and many many many more. Not a single thing to complain. Ok, just one, I missed a full body mirror in the room, but honestly, this was not really a complain. We couldn't be happier to spent our honymoon there, I would like to come back, immediately! We recommend to take more than 3 nights to enjoy the awesome pool and nice surrounding. We were always the only ones at the pool because we split all of our activities on more days, That was so relaxed. It is just a little hotel but that is the best way for us to travel, you will feel magnificient. This was an incredible experience, charming, warm and an excellent place to stay outside of Addo. The food was thoughtfully prepared and tailored to the guests and nothing was too difficult. 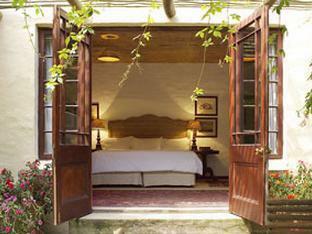 We would definitely recommend this hotel to anybody visiting Addo. 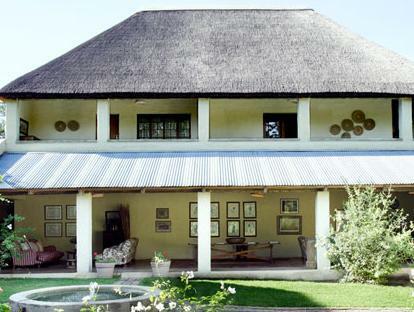 The Elephant house is a English style landhouse with beautyful buildings and garden with great hospitality and good food. We stayed for 1 night in the colonial family suite which comprised a super king sized bed, living area, second room with 2 beds, plus bathroom which was as big as the entire downstairs of my own house! Breakfast was very quaint being on a covered area next to the pool and accompanied by very tame sparrows. The weather was not so good when were there so we did not get the chance to make the most of the leisure facilities at the Elephant house. Overall, if you are just visiting the area to go on safari and want a place to rest your head for 1 night only, then don't stay here. 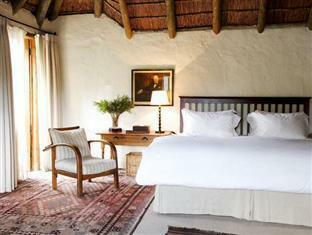 You need to stay longer and spend time at the elephant house to make it worthwhile as the rooms are not cheap. 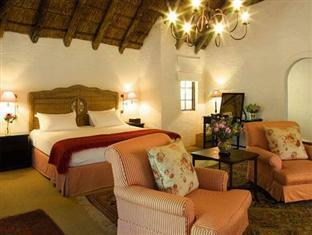 Large Stable room in grounds of comfortable lodge, very convenient for the elephant national park. Not a luxurious room but well priced with all basic amenities, including milk in the fridge, and large patio overlooking grounds. Lots of character in main house with several comfortable indoor/outdoor seating areas. Staff friendly and helpful. Had a wonderful morning drive through the park with expert guide Aubrey, who made sure we saw lots of animals and gave us plenty of time to watch and photograph them. We were also able to book other park drives through the property. Lovely hotel with beautiful Colonial decor. Would recommend to all travellers. My only suggestion would be to heart one of the three pools in winter. We stayed for 2 nights and can only recommend this place. It is located a few minutes in front of the elephant parc and the Building is very Relaxing. We recommend to take the dinner in the Hotel as the only Restaurant nearby is not very good. The location is perfect. The staff went above and beyond. We took their private guide Aubry to the park and he is fenominall. The day we arrived it was raining hard so the kids were hard to entertain as there is no tv in the room but on a sunny day they could have swum. Overall, I highly recommend this place. What a find! 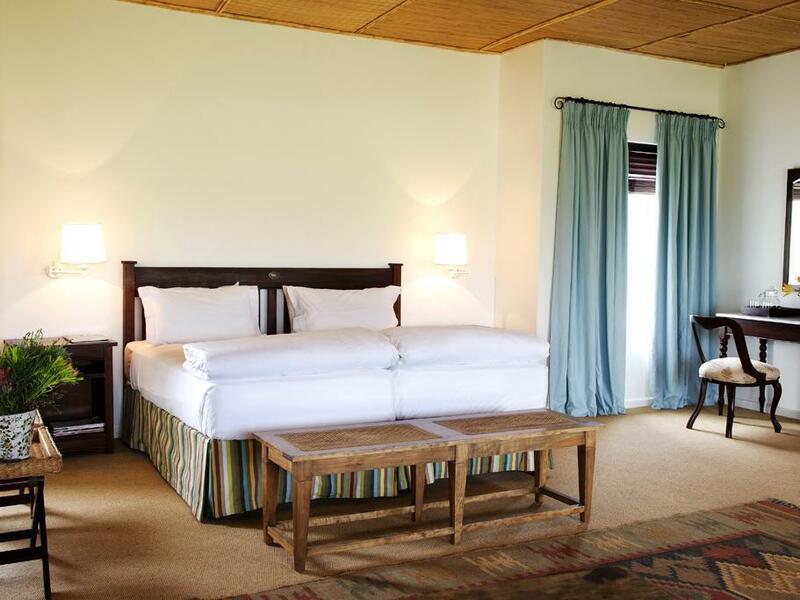 A wide expanse of green lawns, very spacious accommodation and so close to the Addo Elephant Park main gate. The hotel has the feel of a colonial era property but it is less than 20 years old. My family of 4 stayed in one of the separate 'cottages' but we were intrigued by the main hotel building; there are so many spaces in which to relax with large, soft sofas and chairs or large tables and chairs arranged around courtyards. You could chill out and read some of the books on offer or play cards and drink tea. The ambiance is terrific. There are two swimming pools and a delightful-looking restaurant terrace where you can eat on white cloth tables under the shade of a grapevine. Sadly we did not eat here. I would absolutely love to visit again and I would be sure to stay for longer. I loved my room, I wanted to live in it. The owner was very polite and greeted very guest. The staff were very attentive. Veldig koseleg hotell. Vi budde i ei stor hytte med sjarm. Venleg og høfleg personell. Avslappende atmosfære. Ca 10 min frå Addo Elephant park. Wir hatten eines der schönen am Pool gelegenen Stable-Cottages gebucht. Leider wurden wir in der ersten Nacht in ein abgewohntes Cottage, das auf der anderen Straßenseite lag und zeitweise noch nicht einmal über funktionierendes fließendes Wasser verfügte, einquartiert. Aufgrund unserer Reklamation teilte man uns mit, dass die von uns gebuchten Cottages leider dieser Nacht ausgebucht seien. Am folgenden Tag erhielten wir eines dieser am Pool liegenden sehr schönen Cottages, das unserer Buchung und unseren Vorstellungen entsprach. Es fand leider keinerlei Entgegenkommen oder Ausgleich - z.B. wären eine Einladung zum Dinner oder vlt eine Flasche Wein eine Möglichkeit gewesen - statt. So haben wir in der ersten Nacht für eine Leistung bezahlt, die wir leider nicht erhalten haben! Deshalb können wir diese Unterkunft nur sehr bedingt weiter empfehlen. Sorry! Jenseits von Afrika, Alles sehr schön angelegt, toller Pool tolle Hilfe und das Personal sehr nett und hilfsbereit.